The best way to ensure adequate intake of hair vitamins is a healthy, balanced diet. Nutrients for your hair function best from the inside out. Before you head to the nutritional-supplement aisle for hair vitamins, talk with your primary-care physician or a dermatologist. Hair vitamins in your diet are more important than any topical hair vitamins for a thick head of silky, shiny hair. After all, the only part of your hair that’s living is the follicle, and it gets required hair vitamins through the hemoglobin in your blood (hint: adequate dietary iron intake is important). As the hair grows out from the follicle, it undergoes a transformation that basically renders it dead, which means it doesn’t need hair vitamins. At that stage, your hair is keratin, a fibrous, structural protein that’s also in the outer layer of your skin. Hair’s keratin is coated with sebum, a fatty, protective substance that keeps it from drying out. Although keratin cannot absorb topical hair vitamins, that doesn’t mean hair vitamins are useless in shampoos and conditioners. “When you apply vitamin E to your scalp,” according to Livestrong.com, “it helps reduce inflammation and repair damage to the follicles, and healthy follicles encourage hair growth.” The difference is that the hair vitamins in your diet nourish your hair from the inside out. Before you head to the nutritional supplement aisle for hair vitamins, talk with your primary care physician or a dermatologist. That appointment may save you time and money—and your health. Glossy, strong hair is a reliable gauge of your overall health. Because hair is a non-essential part of your body, if something else is amiss—thyroid problems, anemia, hormone imbalances, cancer, autoimmune disorders, for example—your body will deprive the follicles of the hair vitamins they need and send the nutrients to critical failing areas. As a result, your hair will look dull. Your doctor also may run blood tests to look for vitamin deficiencies, which could help target the hair vitamins you need to take and save purchasing unnecessary supplements. Once you’ve ruled out disease, look at your hair products. Anything harsh—such as dyes and perms—can damage your hair. Heavy conditioners will weigh it down, and heat from overheated blow dryers and flat irons will damage the strands. Sun, too, can damage your hair. Brushes should have gentle rounded tips, and combs should have widely spaced teeth. Next comes your normal diet. If you regularly eat a healthy diet, one that includes a good mix of fruits and vegetables, dairy products, milk, beans, nuts, and whole grains—and especially if you also take a daily multivitamin—you’re likely getting all the hair vitamins your body can absorb. Those store supplements are only going to make the hair vitamins manufacturers richer. However, if you’ve done all your homework and everything’s in alignment, supplements for hair vitamins might help. This sounds like a contradiction, doesn’t it? It’s not, because there is one factor that no one can pinpoint: We all have slightly varied individual needs of nutrients. The recommended daily allowance (RDA) measurements are approximations. 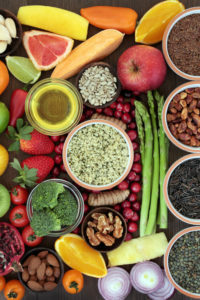 “The average daily dietary intake level is sufficient to meet the nutrient requirements of nearly all (approximately 98 percent) healthy individuals,” explains dietfitnesstoday.com. B complex vitamins, including biotin and vitamin B5 (pantothenic acid): Deficiencies can cause brittle thinning hair, and B vitamins contribute to hemoglobin, which carries nutrients to your hair. Calcium: A deficiency can result in hair loss. Proper calcium absorption requires a proper vitamin D level. Iron: Important to building hemoglobin. Omega 3s: Support hair thickening and reduce inflammation. Fish oil is a good source. Protein: Low-protein diets result in thinning hair and hair loss. Selenium: Low levels of selenium can affect your immune system and result in hair loss. Vitamin E is important in your body properly using selenium. Vitamin A: Vitamin A is involved in the production of sebum; a deficiency can cause a dry, itchy scalp. Vitamin A is a fat-soluble vitamin, which means excesses will build in your body and can reach toxic levels. Vitamin A is important to the zinc in your body. Vitamin C: Helps your body absorb iron and is a strong antioxidant; important to the production of collage, which is a protein important for hair growth. Important to the production of collagen, which is a protein important to hair growth. Vitamin D: Vitamin D plays an amazing, varied role in your body, and many people are deficient. For hair, it helps with hormone regulation and stimulating follicle growth. A deficiency can result in hair loss. Vitamin D is a fat-soluble vitamin, which means excesses will build in your body and can reach toxic levels. Vitamin E: An antioxidant that can help repair damaged scalp tissue. Important to utilizing selenium. Zinc: Important in tissue repair, including your scalp. A deficiency of zinc can cause a dry scalp and hair loss. Deficiencies of vitamin A can cause a zinc deficiency. 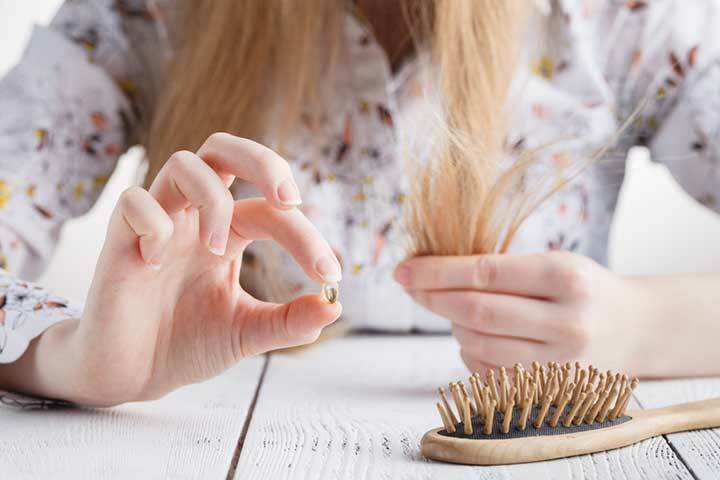 As you can gather, it would be easy to spend big money on all these hair-vitamins supplements each month, but chances are good you don’t need them all. anemia, antioxidant, antioxidants, b vitamins, biotin, blood pressure, calcium, cancer, collagen, dairy, diet, fish oil, hair loss, hair vitamins, health, healthy diet, hormone, immune system, inflammation, iron, low blood pressure, lower blood pressure, lycopene, milk, nutrients, nuts, omega 3s, protein, reduce inflammation, selenium, skin, supplement, supplements, thinning hair, thyroid, vegetables, vitamin, vitamin a, vitamin c, vitamin d, vitamin e, vitamins, vitamins and minerals, whole grains, zinc. interested in the stregethening and no loss of hair.